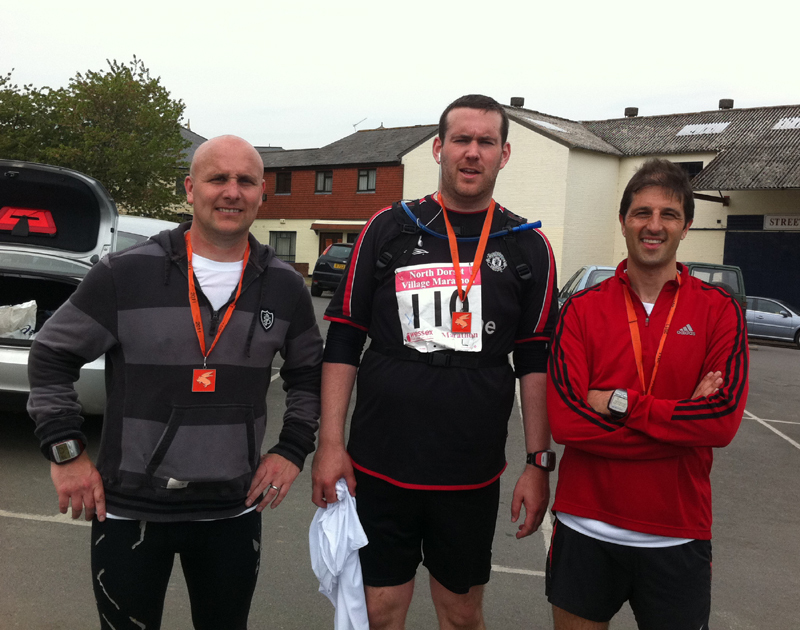 I took part in the North Dorset Village Marathon with Stouty (Fetch: Stouty) and Matt (Fetch: Cheeky Conswala). We had travelled down the night before and stayed over at a B&B in Yeovil before making the short drive to Sturminster for the start of the race. We spotted one Fetchie before the race (hello Mr K) although we also spotted Martin Yelling lining up for the race aswell. The pre-race strategy was to run 8 – 8.30’s, easing off at each water point (as I hadn’t planned on carrying a hydration pack and it was meant to be warm) and aim for a 3.45 finish. However, this was a training run for the GUCR and Stouty and I had run the Compton 40 last week so the finish time was secondary to getting in some good miles. 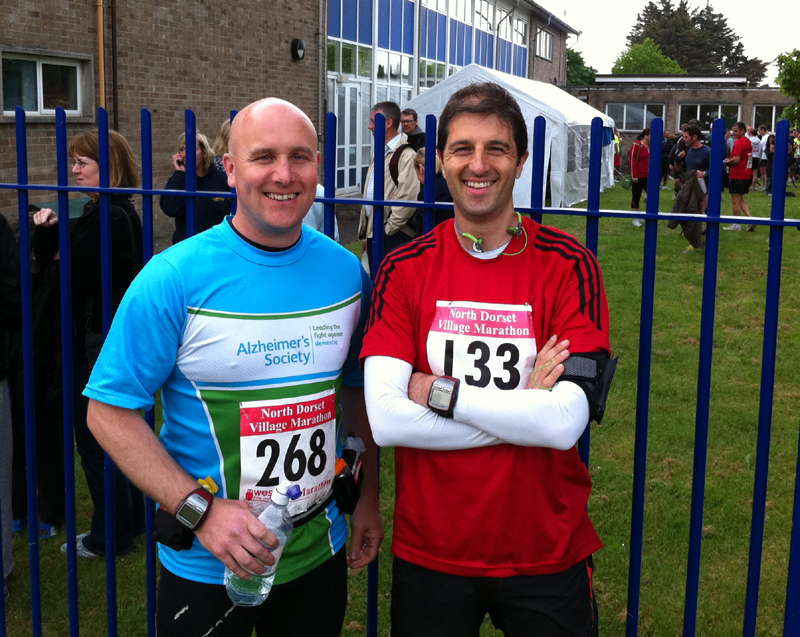 Stouty’s plan was to simply run and get under 4 hrs and Matt was running his first marathon so his goal was to keep to a steady pace and to finish in a comfortable state. As the race started, Stouty and I started off together near the back but after the first mile I had to stop for a “comfort break” and didn’t see Stouty for the rest of the race! 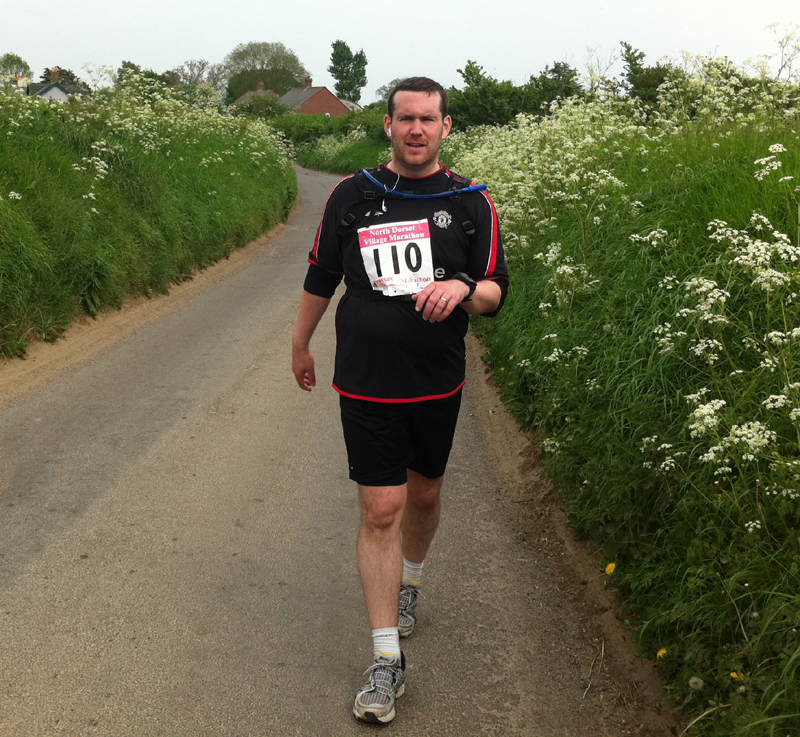 I settled down into a comfortable running place as the route led us up and down a couple the hills around Dorset. Looking at my mile splits, the first 10 miles were all between 7.30 (a fast downhill mile) and 8.22. I was slightly quicker than I had planned on average but was fairly comfortable with the pace knowing I would probably slow a little the second half of the race. The course markings and marshalling was good and there were plentiful water stops (every 3 miles or so) which was well appreciated on a warm day. I took an energy gel just before 10 miles and carried on at a steady pace chatting to a couple of guys on the way round before easing ahead of them. I passed the half way point at about 1.45 and at that point was on for the planned 3.45 if I could manage a 2hr second half. Constantly checking the Garmin was a little bit of a motivator and the mile splits between 10-17 were all between 7.44 and 8.18 and all felt reasonably comfortable. The day was sunny and a couple of times it felt quite warm but there was a fairly strong breeze which did cool you down but constantly seemed to be blowing in my face despite the course effectively being a large loop. I started to slow at around mile 18 and took another gel but had slowed somewhat and the next 4 mile splits ranged between 8.00 – 8.46. I passed the 22 mile marker just after 3 hours and then started to calculate possible finish times. I was starting the feel the effects of the race and knew that if I could manage at worst 10m/m pace I would be on for a 3.40 finish, if I could carry on at the 8.30 – 9 m/m pace I would be a few minutes under this allowing for the extra .2 of a mile at the end. 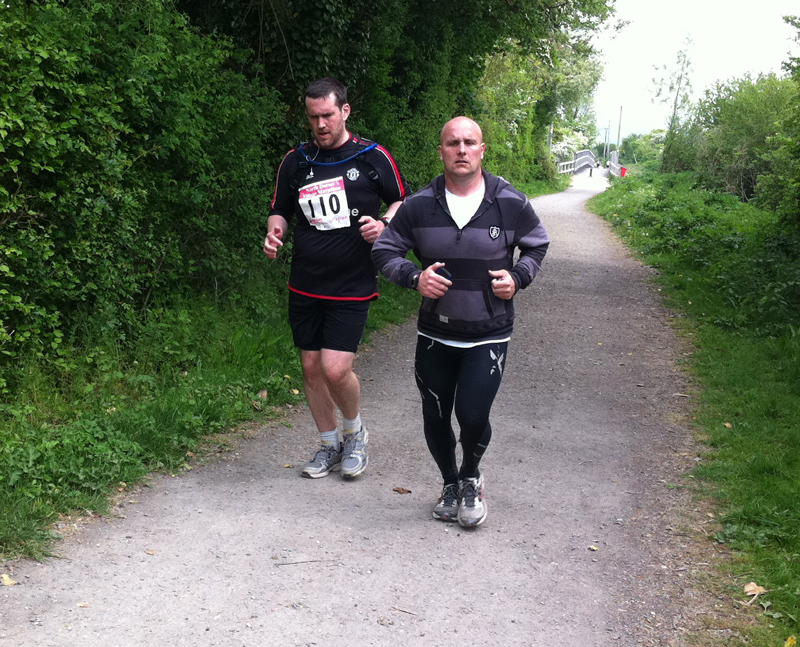 I pressed on and fell into a pace behind another runner I had been chatting with on the way round. The mind started to wander a bit at mile 23-24 but the end was getting closer. I did feel a niggling complaint to my right thigh which I put down to the camber of the roads and the hills but thankfully it just felt uncomfortable. As I got closer to the finish I took a right hand turn onto a long track path which was a 1 mile (approx) finishing straight with a gradual incline. I felt a bit lethargic at this point and slowed to a walk a couple of times but as soon as I could see more people at the end, I broke back into a trot until I could see the finish line. The last mile was the slowest at 9.23 but there was a short dash to the finish line to finish in 3.36.12, a new PB by 19 minutes. Overall, the race went well. My pacing was fairly disciplined with only a 6 minute difference between the first and second half and I had slowed to a walk at each water point to take on water and rest the legs for a few second. Having run more Ultra’s than marathons recently, I was pleased to have “run the race” rather than fall into a slower paced run/walk strategy. The training mileage was probably the major factor in the new PB as I was able to maintain my planned pace fairly consistently throughout the race despite flagging a bit at the end. The course was undulating the whole way round and the weather was fairly breezy, so on a flatter course with cooler conditions and a bit more focus on a marathon race (i.e. a proper taper), sub 3.30 is within reach. Stouty finished the race in 3.29.40 which was a great result especially after a disappointing run the week before. Surprisingly, this was the first time he’s come under 4 hrs, so he smashed his marathon PB by over 30 minutes. There was some transport from the race finish to the start, so we quickly hopped on the bus and picked up the car from the school and drove back to the finish to meet Matt. We had agreed to jog back down the route (a warm down) and give Matt some company for the last (likely tough) couple of miles and we eventually spotted him around mile 24. The three of us jogged the last couple of miles together before Matt ran the last few hundred yards up the finishing straight finishing in around 5.15 in his first ever marathon (which of course is a new PB). He was tired but pleased to have got round fairly comfortably. At the end of the race we each received a T-Shirt, “flying pig” medal and there were plenty of water, coke or squash and some beer at the finish. The race was good value for money at approx £20 which included the aforementioned T-shirt, medal, drinks and plenty of water stops. The route did follow public roads which were not closed so at times you did have to take care with the odd inconsiderate driver forcing their way past runners but there was a police presence at each of the crossing points so this was as well organised at it could have been. A good day out overall.